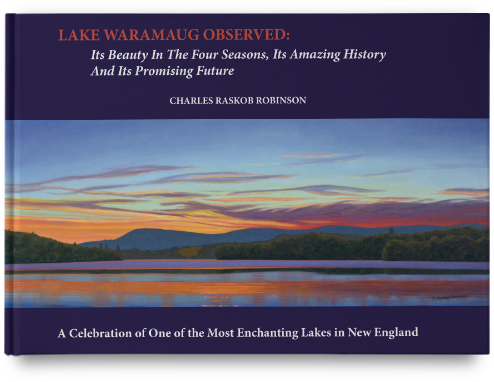 This latest book by artist/author Charles Raskob Robinson contains nearly fifty full color paintings of Lake Waramaug and surrounding waters and is printed on top quality glossy paper in a 132 page, 8 ½” x 11″ hardback edition. The book puts into larger perspective the important work local environmental organizations are doing. Part I, the Present, shows the diverse beauty of Lake Waramaug in its four seasons as seen in thirty-five paintings of the same scene executed under different conditions over two years. Each painting tells its own story. Selected observations made in the artist’s log book during the painting process accompany each of these paintings. Part II, the Past, is a fascinating long-view of the Lake’s history from the Lake’s probable beginning eons ago, through the Ice Ages that sculpted the Lake, the Five Mass Extinctions and, finally, to the return of flora and fauna and the arrival of humans. 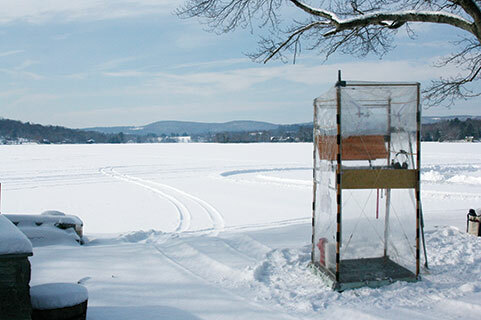 Although Lake Waramaug is the special place we have come to know and love, the threat of the Sixth Extinction looms. Finally, Part III, the Future, reviews the noble efforts and successes in recent decades by farsighted leading individuals and organizations to preserve and protect the Lake and this part of the country so future generations of all life forms will survive. It puts into perspective the important work local organizations are doing and shows how you can participate in saving your future and that of generations to come. Purchase this book on the link below. It is also available at the Hickory Stick Book Store in Washington Depot, the House of Books in Kent and in the gift shop of the Institute for American Indian Studies on Curtis Road, Washington.